View More In Tap Lights - Page 5. Using advanced infrared technology, the LED light is quite sensitive and bright. With infrared sensor, the light will turn on or off automatically without sound and switch control. It's designed to provide people with convenience in the dark, which is ideal for bedroom, baby room, closet, cabinet, corridor, workshop, basement, garage, stairwell, oil depots, roof, door, garage entrances and other places. Easy to install without tools. - The LED light won't work at daytime when it is bright enough. - There's transparent film on the surface to protect the LED light. - If the light is dim or the sensor is not sensitive enough, it means it need to new batteries. - The light is non-waterproof, so it must be stuck in the place where's dry. Automatic Sensing: It will lights up when you get within 3 meter of the detection range and will go out in 15 seconds after walking out of its sensing range. Simple Installation: With an adhesive tape on the detachable magnetic strip, it is easy to attach to the smooth surface. No tools, screws or nuts are required! Battery Operated: Powered by 4pcs AAA batteries(NOT INCLUDED), it works day & night and provides excellent illumination. Fashion Decoration: Bright enough to guide you indoor and outdoor. 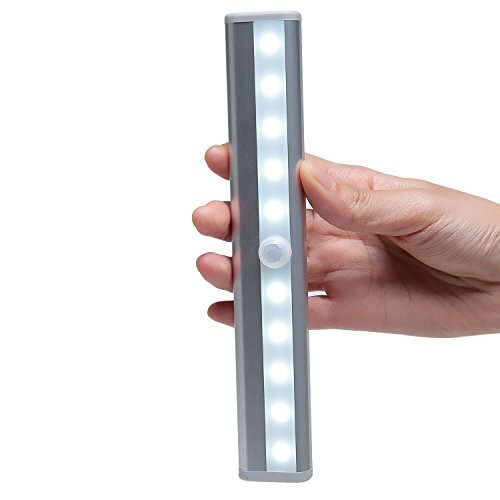 10-LED light with sensitive motion detector is portable, energy-saving and environmental-friendly. It's really great for your closet, cabinet, bedroom, bathroom, garden, etc. No Wiring Required! 100% Satisfaction Guarantee: Your satisfaction is our guarantee, if you aren't happy with your light for ANY reason, let us know and you get your money back. That is how confident we are that you will LOVE your motion sensing closet light. If you have any questions about this product by Pacuwi, contact us by completing and submitting the form below. If you are looking for a specif part number, please include it with your message.